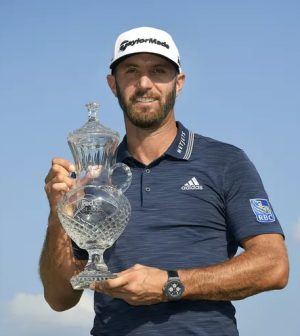 Dustin Johnson put on an impressive performance Sunday at the St. Jude Classic to win his second event of the season and 18th PGA Tour win of his career. Dustin reclaims No. 1 world rank and secures himself a spot in the U.S Open. Johnson holed out for eagle from 171 yards for a dynamic finish. The eagle got him to 19 under for the week, and he beat runner-up Andrew Putnam by six. Playing the 18th hole with a four-stroke lead on Sunday in Memphis. Dustin Johnson finishing his round with an incredible Eagle shot to take the #1 world golf ranking.